Almost every move in football can lead to some sort of injury, from rushing and catching to tackling and throwing, be it from overuse or sudden impact. Injuries happen. Dwayne Treolo, former head ATC for University of Louisville and Anna Muñoz, Staff Athletic Trainer/Product Education Specialist for DJO Consumer, LLC, have 20-plus years of experience working with collegiate and professional athletes. There are many studies that show if your foot gets stuck while your body goes a different direction, believe it or not, you'll create much more force than if you're hit from contact explains Muñoz. Players injured by direct contact tend to get ligament injuries that are associated with fractures. 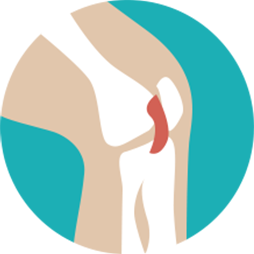 ACL injuries can occur from either direct contact to the knee usually a lateral blow to the knee. 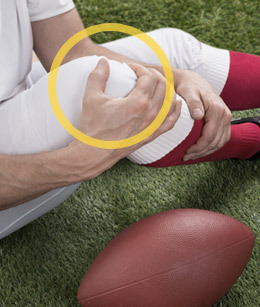 This is typically seen in football and includes associated injuries to the MCL and Meniscus. The ACL can also be torn during non-contact activities. The athlete usually reports running down the field quickly stopping, changing directions and feeling a pop. So what's to do if you have an ACL Injury? Immediately treat the pain and reduce the swelling. Work on range of motion (about a week after initial injury), which should be near normal except for extreme ranges. Athletes should then work on strengthening the injury, progressing from isometrics (no movement) to concentric (shortening) and eccentric (lengthening) movements. With the right recovery program and bracing, athletes can return to their pre-injury state. "It's normal for the football player to be better the second year back." The first year back athletes are still strengthening the ACL, but the second year back it should have it's strength back. An offensive lineman for a school at any level is in jeopardy of getting this valgus blow (a blow to the outside of the knee while the foot is planted). 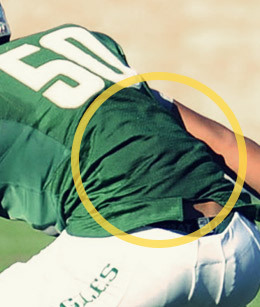 Without a high-quality knee brace to protect the knee it is probably a matter of time before such an injury occurs as the lineman receives a hit like this. The exposure time in practice has increased and this type of protection has even crossed over to the defensive linemen in most Division 1 programs. Assuming it's a relatively isolated ACL injury, 95 percent of athletes can return to the same pre-injury level. After Treolo began bracing, the MCL injury was all but eliminated. There were few who had MCL/ACL injuries, and were less severe, making for a quicker recovery than before he began bracing his athletes. I only had one linemen over the next 11 seasons get surgery from a practice or game related knee injury. "I use the Defiance made by DJO. 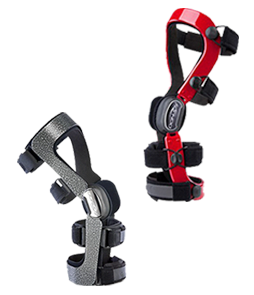 This brace is commonly used following surgeries for ACL and MCL, but using it prophylactically for linemen is becoming part of today's uniform. Treolo explains how dislocations are more rare than sprains, but once the ball comes out of the socket, it will keep coming out-and football just exacerbates the possibilities. 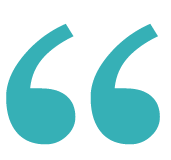 "There are several products on the market that offer secondary support to the joint. Usually these devices are used to get an athlete through the season at which time they will get a surgical procedure to "tighten" the joint up again," explains Treolo. Once an injury happens, seek medical attention ASAP to get the exact diagnosis. This will help map out the recovery plan. In order to get back to pre-injury level, make sure to reduce the swelling and inflammation, and then work with your physician for rehab exercises to get the range of motion and strength back. There are a lot of lace-up braces on the market in the 18 to 30 dollar neighborhood. This is the minimum I would want my athlete in, example the DonJoy Stabilizing Pro. Protection higher up the ankle is necessary and the Velocity ankle brace has a special ratcheted cuff up the lower leg which offers such protection. A solid footplate helps reduce the external rotation. 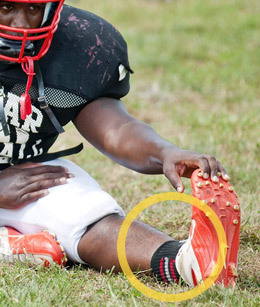 Whether cutting side-to-side, running forward or back, jumping, or direct trauma (such as a player tackles another) football players can easily injure the foot or ankle. An ankle injury or ligament strain can be associated with fractions-and cause pain. It's ideal to stay off of the injured foot/ankle for a bit to reduce the swelling. While some believe taping helps reduce pain and stabilize the injury when back in sports, Treolo believes ankle braces are much more effective and comfortable. Make sure to reduce the swelling and inflammation, and then work with your physician for rehab exercises to get the range of motion and strength back. One wrong movement or small tweak can cause acute back pain, or worse, slipped disc. In fact, research shows that 25 percent of college athletes encounter a back injury during their football career. Stress fractures and muscle strains are fairly common, but early intervention and treatment can assist in a quick recovery and return to participation. Back pain usually starts as an ache and turns into a chronic pain, usually found in the low-to mid-back area. Other factors of back injuries include poor form or technique, weak core or tight hip flexors and hamstrings. Pain can increase when sitting, which is why many physicians and medical experts do not advise long periods of sitting. Sometimes numbness, tingling or weakness in the hips, legs or feet can also be a result of a back strain. Treolo explains how athletes should begin a strength and fitness programs several weeks prior to the start of the season to strengthen weak muscles. They can gradually increase the frequency and intensity of their program at a safe rate to develop proper form and protect their back. A supportive back brace can provide compression, relieving the pain during any activity, suggests Treolo. 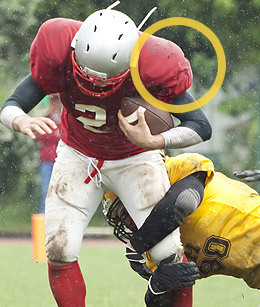 Due to the rough and tough movement that football players undergo, it's easy for them to snap a finger or strain a wrist. 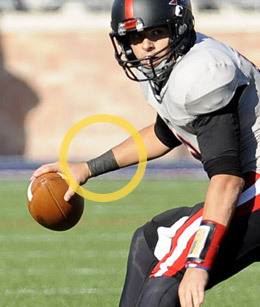 Stabilizing the wrist is essential for a quarterback or receiver because they need the support to throw and catch the ball. Supportive gear can prevent this and speed up recovery. A wrist brace allows freedom of the hand from splinting and controls movement, which can prevent re-injury. Wrist injuries in football can occur from tackling and most often just from falling down after a tackle. After a wrist injury it's important to get a diagnosis so you know what you're dealing with while bracing can help to immobilize the joint to help with the pain and allow the joint to heal.